(Nanowerk News) The factory of the future is now coming to the aerospace industry. To help it along the way, a consortium made up of European research institutions and industrial partners is developing mobile, autonomously operating robots. These robots will help with the assembly of aerospace components and work hand-in-hand with humans on the production floor. VALERI is the name of the project that was initiated and now coordinated by the Fraunhofer Institute for Factory Operation and Automation (IFF) in Magdeburg, Germany. Together with their industrial partners, Airbus Military, FACC, IDPSA, and KUKA Laboratories GmbH, and their research partners PROFACTOR GmbH and PRODINTEC, the robotics specialists want to make their vision a reality. VALERI stands for “Validation of Advanced, Collaborative Robotics for Industrial Applications”. Within three years, the consortium plans to develop applications and test mobile robots that will later be integrated in the production of aerospace components. 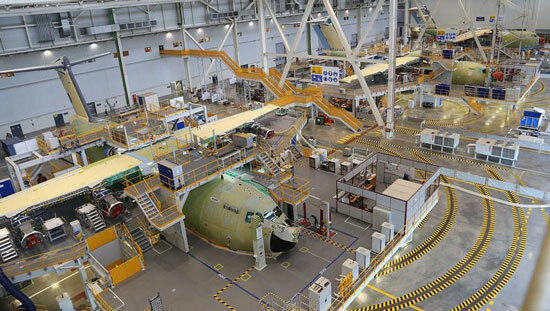 Aircraft production at Airbus. Autonomous robots will also be used in equipment production in the future. The trick is for the robots to be able to work side by side next to humans, without separating barriers between them, so they can take over monotonous jobs and free their co-workers up for more value-added work. The project is supported by the European Commission under the FP7 “Factories of the Future” Public-Private Partnership. This partnership is designed to help increase the competitiveness of European companies through the development of technological know-how, and ultimately contribute to keeping manufacturing jobs in Europe. In the production where the robot is planned to be used, large parts are worked on in a stationary production cell. Over a period of days, multiple shifts of workers complete the assembly and inspection tasks. In such a production environment, specialized, stationary robotic systems are not economical. The employment of mobile manipulators is a means for achieving economical application, by allowing for one robot to be used for similar tasks in multiple stations. The planned robot system has, in comparison to traditional industrial robots, lower programming times, leading to increases in both speed and flexibility. The project aims to carry out two exemplary tasks that have been identified as strategically important for their production, namely carrying out inspections on large surfaces (e.g. covering elements) and applying sealant along a groove. These tasks are carried out in variations at virtually all assembly stations, so it is expected that the final system will be highly productive. Within VALERI, the project partners are developing a system that is both an adaptive and flexible aid in the production of craft and small batch parts. That makes it interesting for aerospace production as well as for other manufacturing sectors.